In honor of J.S. Bach’s 333rd birthday (March 21, 2018), BachBeer has a unique tripel on tap: three March birthdays, three beers, and three pieces of Baroque music. Our first March birthday is GEORG PHILLIP TELEMANN. Born on March 14, 1681, Telemann was, during his life, probably the most famous composer in Germany. This distinction is all the more impressive because Telemann lived at the same time as J.S. Bach. Telemann and Bach once competed for a job. When Johann Kuhnau died, he left a vacancy at his position as the cantor of St. Thomas Church in Leipzig. Telemann was the first choice for the job, but he only used the offer as a bargaining chip. Once he got a raise from his employer in Hamburg, Telemann declined the position in Leipzig. Bach was the third choice, but he was awarded the position after the runner-up, Christoph Graupner, could not get a release from his job in Darmstadt. Bach had the last laugh. His posthumous reputation, which is bolstered by many works he wrote during his nearly three decades at St. Thomas, dwarfs Telemann’s. 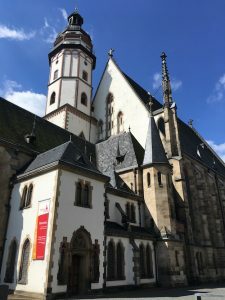 Today the St. Thomas Church is really the “Bach Church.” A statue of Bach stands outside the church, an organ bearing the Bach family seal stands within the church (and also is the header photo of the BachBeer Twitter profile), and Bach’s remains are interred in the chancel. Telemann spent most of his adult life in Hamburg, where he was the music director of the Johanneum, the city’s five largest churches, and the Opera House on Gänsemarkt. In addition, he published an incredible number of musical pieces—over 3,000 in all. These pieces encompass an enormous variety of styles and instrumental combinations, and many of them are accessible to amateur performers. 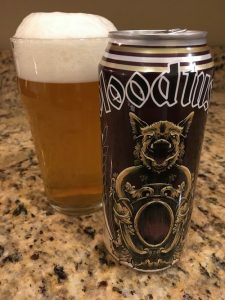 Telemann’s music pairs well with Bloodtusk Lager from Asheville’s Burial Beer Co. Just as many modern listeners prefer the arcane Bach to the accessible Telemann, many beer drinkers prefer the fruity complexity of ales to the crisp subtlety of lagers. These preferences too often deny consumers appealing flavors. Bloodtusk is a kellerbier, an unfiltered style that first appeared in medieval Germany. Kellerbier has more hop bitterness than helles lager but less than German pilsner, and it has more yeastiness than both. Bloodtusk is an authentic and refreshing take on the style. One of Telemann’s most famous pieces is his Musique de table or Tafelmusik (“Table Music” in English), a collection of pieces written to accompany banquets and other dinner parties. As Chicago Symphony Orchestra annotator Phillip Huscher writes, the set is “an assortment of pieces for increasingly smaller performing forces—an orchestral suite, a concerto, a quartet, a trio sonata, and a solo sonata,” and it is “uniformly stylish and colorful, imaginatively scored, and occasionally even touched by Telemann’s penchant for wildly descriptive writing.” Telemann’s brilliant banquet music is a perfect match for a refreshing beer. Our second March birthday is ELISABETH-CLAUDE JACQUET DE LA GUERRE. Jacquet de la Guerre predated Bach and Telemann by about one generation, and she was baptized on March 17, 1665. Jacquet de la Guerre was a harpischord prodigy who played at the court of Louis XIV when she was five years old. The king was impressed, and when Jacquet de la Guerre was about 15, she entered the royal court as a musician under the auspices of the king’s mistress, Madame de Montespan. Jacquet de la Guerre’s first published work was a collection of harpsichord pieces. This 1687 publication, Pièces de clavessin, was one of the few published collections of French keyboard music, and it remains popular among early musicians. Elisabetta Guglielmin performs a piece from the collection below. Jacquet de la Guerre went on to publish many more instrumental and vocal works, including Céphale et Procris, which is generally considered to be the first French opera by a woman. Today, her harpsichord pieces, sonatas, and cantatas mark her as a musical pioneer who blended Italian and French traditions. Jacquet de la Guerre dedicated all her works to Louis XIV, a.k.a. the “Sun King,” so we also dedicate her beer choice to him. Sun King Brewing is an Indianapolis brewery that recently expanded its distribution into Chicago and Louisville. Pair what Draft magazine called the “prickly carbonation” of Sun King’s Sunlight Cream Ale with the prickly twangs of Jacquet de la Guerre’s harpsichord pieces. Our final march birthday is JOHANN SEBASTIAN BACH, who was born on March 21, 1685. He needs no basic introduction, so we’ll skip straight to the beer. The word bock sounds like Bach’s name, and it also is the German word for ram or goat, two animals that match the personality of a street-fighting composer. Doppelbock beer is darker and more powerful (higher alcohol) than a normal bock, but it retains the lighter style’s characteristic sweetness. 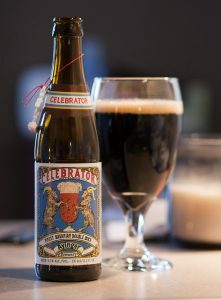 The quintessential doppelbock is Ayinger’s Celebrator, which comes in a bottle with a plastic goat pendant around its neck. The opening chorus of Bach’s St. Matthew Passion is like a doppelbock. Dark and powerful, the music also features the sweetness of children singing about an innocent lamb. Sample it below, and lift your next beer glass to the memory of three days in March that changed music forever.